Superb character compression, EQ and distortion from one of the coolest plugin developers around - get all three if you can. Stunning saturation colours. Kaya's subtle, unique tone could add character to anything. Axis EQ's UBK setting allows precision. Deflector could do with gain compensation and more THD options. Kush Audio has always been about innovative analogue hardware devices and software versions of the same - main man and certified audio genius Gregory Scott has never seen the benefit of simply emulating other commercially available units. However, his passion for heavily modifying his own classic gear has led him to realise that emulations of those mods could find an audience. The three plugins in the OG Trifecta Bundle (also available individually) comprise the Deflector compressor, Axis EQ and Kaya saturator, currently in VST and AU formats, with AAX "coming soon". 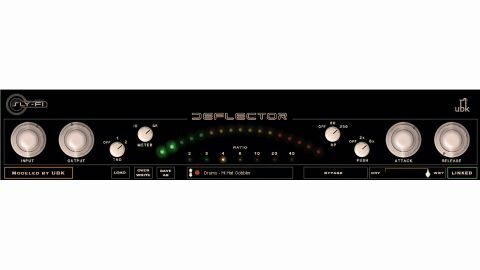 Although it isn't immediately obvious, Deflector is based on a modified Empirical Labs Distressor, a compressor found in most high-end studios, usually in pairs. It's a digitally-controlled analogue VCA device beloved for its aggressive compression and saturation, and it makes a very effective orthodox dynamics leveller. Deflector has Input and Output knobs on the left (the threshold is fixed), Attack and Release knobs on the right, with a Total Harmonic Distortion switch (Off, 1 and 2), a Meter switch (I/O and Gain Reduction), a high-pass sidechain filter (off, 60Hz and 250Hz) and a Push control (Off, 2kHz and 6kHz) in between. In the centre is a 15-spot LED-style meter, below which sits the compression Ratio selector (2, 3, 4, 6, 10, 20 and 40:1). In the bottom strip are the preset management options, a Bypass switch, a Dry/Wet mix slider for parallel compression, and a Link/Unlink switch for dual mono/ stereo operation. "Deflector is based on a modified Empirical Labs Distressor, a compressor found in most high-end studios." The THD switch gives two flavours of distortion: 1 is mild with a hint of crunch, 2 is much dirtier and grimes up the bottom end. A few more flavours or an incremental pot rather than a switch would have been good. The high- pass sidechain filter prevents the low-end from pumping the compressor; and for harsh material, the Push switch emphasises the high frequencies in the sidechain to attenuate them - a sort of de-esser, essentially. On drums and bass, Deflector is particularly good at fattening and gluing the low-end, and giving it character. It also works well on vocals, bringing them forward nicely. Being such an aggressive effect, though, some sort of auto- gain correction would be helpful during the setup process, since there's the potential for speaker/ear damage if you forget to turn the Output down before hitting the Input with a hot signal. And there's no 1:1 setting as on the original, so you can't just enjoy the distortion without the compression. Based on the classic API EQ, Axis is the most recognisable of the three emulations because its controls are so idiosyncratic. It has four bands instead of the three of the 550A series, and a three-way switch (A, B and UBK) flips between the two curve/character variations of the original hardware (the vintage A and more modern B) and a UBK version, which is customised and has continuous gain and frequency controls, rather than the stepped switches of A and B. "If you're a fan of analogue distortion in all its forms, you'll love them." This immediately makes it more precise for finding and adjusting problem frequencies. Each of the three settings hosts its own independent EQ setup, which is handy for A/B-ing. The most interesting addition, however, is the input Saturation knob. This adds a fatness and openness to the bottom-end that the EQ alone can't. The sound of the EQ itself is reminiscent of the original API in its hardness, and the modification to this model clearly plays on the variable Q that goes with gain adjustment, giving quite a 'nose' to mid frequencies that helps them cut through. Finally, Kaya is based on a one-off saturation unit built by sound engineer S Husky Hoskulds using an old Ampex valve tape machine preamp. It delivers dirty low-end distortion that can be exaggerated using the central Breakup control, while the Abuse knob adds further crunchy low- and high-end grit. A broad Treble shelf EQ gives relatively subtle control of colour, opening up or darkening the top end; and the Movement knob dirties up the bottom end even more. It's a Marmite effect: variations on one saturation colour that you'll either love or hate. What all three Sly-Fi plugins have in common is a 'de-digitaling' effect. If you're a fan of analogue distortion in all its forms, you'll love them. They have a visceral fatness that you feel through your body and hear with your ears. Deflector is the star of the show for the variety of tones it makes available and the range of actions from gentle to violent; but Axis is a stunner, with its classic API sound, bullish attitude and the added precision EQing of the UBK setting. That said, though, you might actually end up using Kaya more than the others, because of its character and instant gratification.